I came home from work to find that the new pump housing was delivered for the closed loop pump. I also had a happy surprise at work that the new mag-drive for the wavemaker was delivered. I spent part of the evening installing the new hardware and hooking everything up for a test of the wavemaker. I knew I should have stopped testing when the first thing I did was not line up the O-ring on the union for the pump correctly. I had a nasty drip and immediately had to drain the pump to reseat the union. 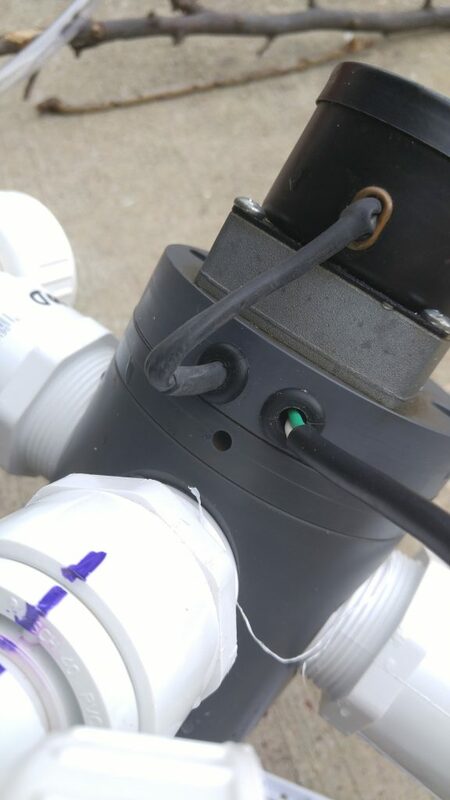 As I was adjusting the returns, I found out that the one return that was leaking was because I did something silly… like forgot to glue the fitting. The fitting popped off and the pump started spraying water all over the garage. I estimate about 15-20 gallons made it out of the pipe before I got everything unplugged. I called it a night after this and went back inside the house. I’ll glue the fitting back on tonight and be ready to turn everything back on tomorrow after making sure everything is dry. I haven’t sealed the plywood yet, so I’ll probably end up making a new floor for the stand. I got the new pump installed an plumbed. I filled the tank back up to leak test. I also finished building the controller box and hooked up all the electronics. I’m now testing the tank using the controller to run the chiller/heater and pumps. I still have to mount all the float switches and do a lot of cable management, but it’s all working. I also still need to figure out how I’m going to mount the controller box to the bottom of the stand. The biggest problem I’ve had with trying to finish the aquarium controller is how I was going to update the Arduino after I buttoned up the box that it’s all housed in. I was finally able to get a method working to flash the Arduino from the PI itself. I went through 3 different possible ways of doing it before finally finding one that worked. What I settled on was using PlatformIO. While working through the various methods, I landed on a bug report for Arduino 1.6 where someone mentioned successfully using PlatformIO from the command line on a headless system. I took a look at PlatformIO and found that they had a version that worked on the ARM processor. I installed it and quickly learned how to use it. I re-flashed my Arduino using my existing code and everything still worked. The only downside to flashing the Arduino is that all the relays shut off while everything is updating. This will not be something I want to do very often. Right now the Electronics stack is running on my workbench monitoring the parameters in a 5 gallon bucket. I put some pool Alk-up into the water so that I can watch the pH slowly rise. I still need to write the code for calibrating the pH probes, but everything else appears to be working. 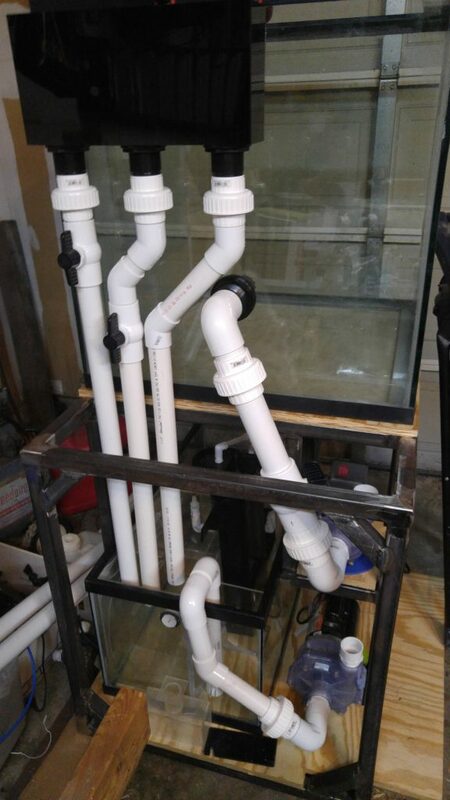 Got the plumbing all done and got the aquarium filled. Running into a couple of problems that I’ll have to work out. 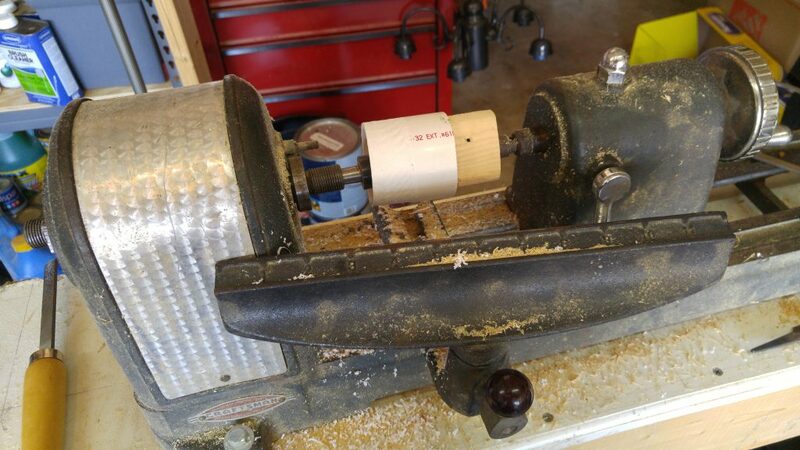 1) Getting used equipment usually means finding out what works and what doesn’t. 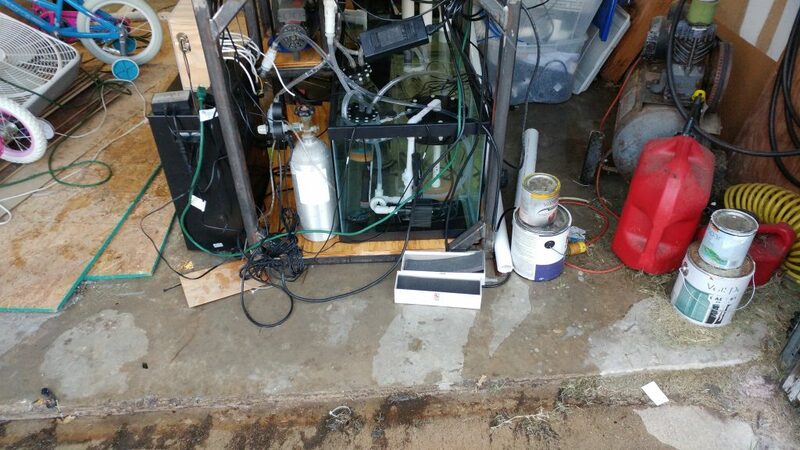 After getting everything hooked up I found out that the smaller pump and the ocean’s motions both leak. I’m wondering if the ocean’s motions devices have problems being mounted sideways? I emailed the company to find out. The device seems to be leaking out of a little hole on the side. Need to figure out what this is for and why it would be leaking out of there. 2) Some of my plumbing leaks. Not much. A drip every other minute or so. And the over flow box I bought has a little drip in the corner. about 1 drip per minutes. The overflow box I can probably seal by draining it and putting a bead of silicone in it and running some more acrylic glue into the corner. 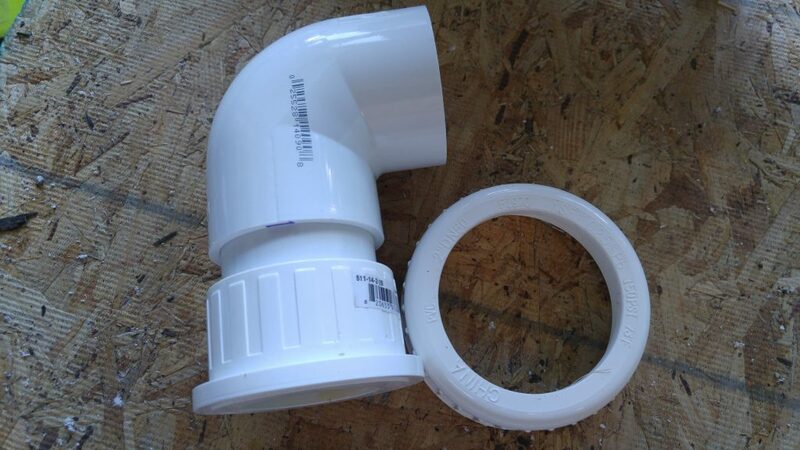 Not sure what to do for the other PVC fittings… re-do? silicone? put some glue on the outside and squeeze? 3) micro-bubbles. The main return is throwing micro-bubbles everywhere. I’m thinking it’s probably because I forgot to put a bubble trap on the last overflow into the last section of the sump. I’ll need to drain the sump and add one. 1) The Beananimal overflow works. I threw a quick acrylic lid on the external box and there’s only the slightest noise. 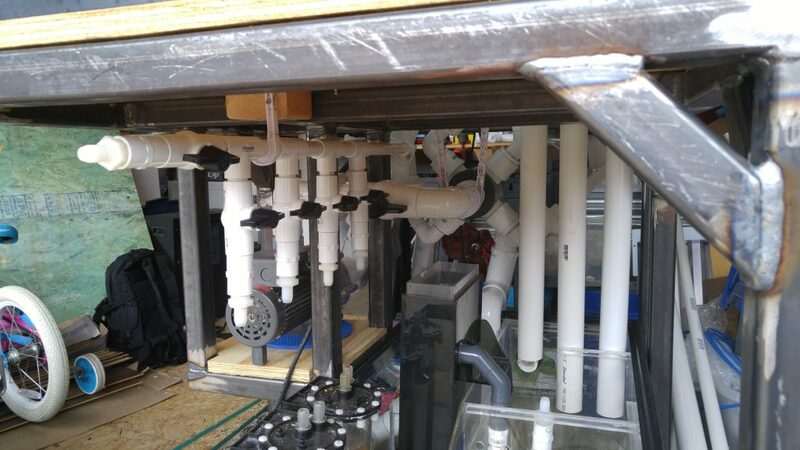 2) The main pump, while overkill, can easily be turned down with the ball valve and easily drives all the equipment in the sump as well as the main return. There is a decent hum, but I think once the sides are on the stand it will be much quieter. Most of the sound seems to come from the pump side and not the motor side. If the neighbor’s AC is running (locate right by my garage), then I almost couldn’t hear the pump. 3) The sump is more than adequate to hold all the water that drains back. I have about 4-5 inches left in the top of the sump when everything is off. It also looks like I still have plenty of room under the stand for my controller. 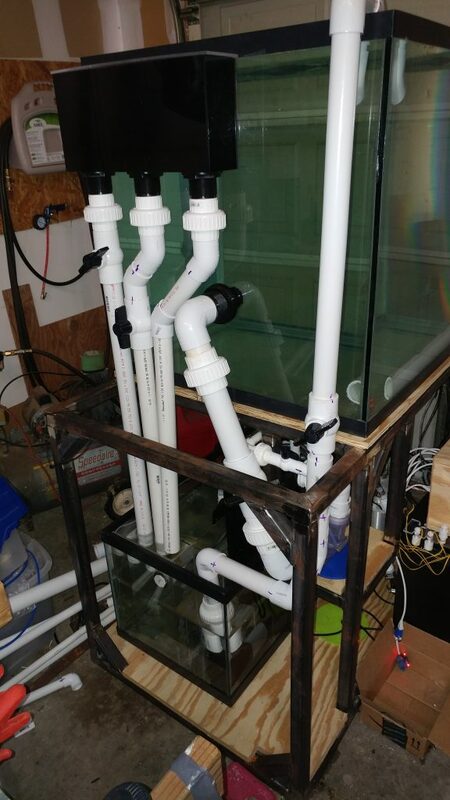 Adding a top-off tank is going to be tight. Don’t expect much else for the next few days. Really, all I have is plumbing. Lots of plumbing. The canopy still needs to be built and the rest of the box for the electronics for the controller, but mostly it’s just plumbing. 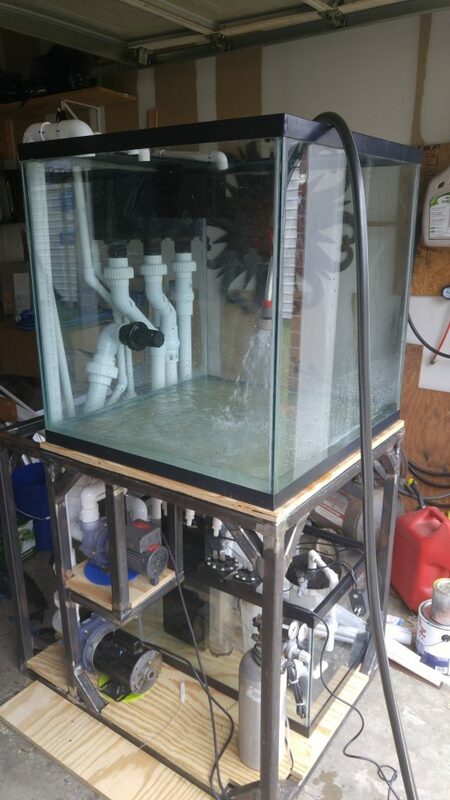 Last night I was able to finish off the main return from the primary pump and I was able to get the Ocean’s Motions wave maker mounted. I decided to mount it horizontally. This allowed me to use J hooks on one side to support most of the weight and some zip ties on the motor side to support the rest. I also moved the fill fitting for pre-filling the main pump from the top of the return down to the top of the inlet pipe. I didn’t like how high it stuck out over the top of the tank. 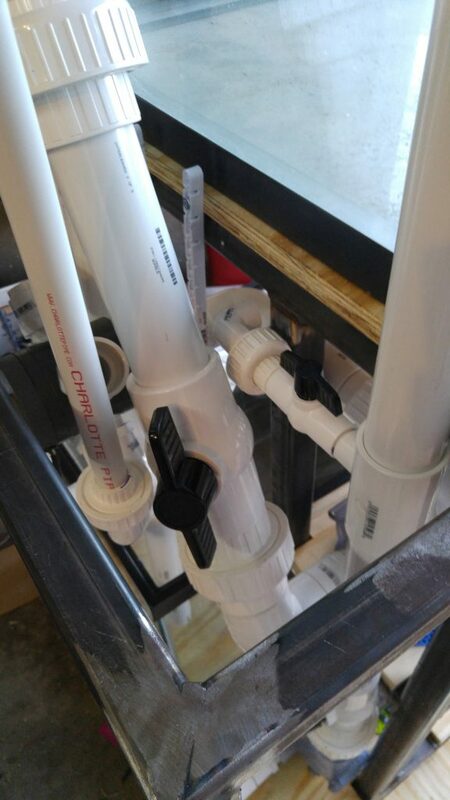 It’s not like the pipe would fill with water any higher than the U-tube over the edge of the sump anyways. 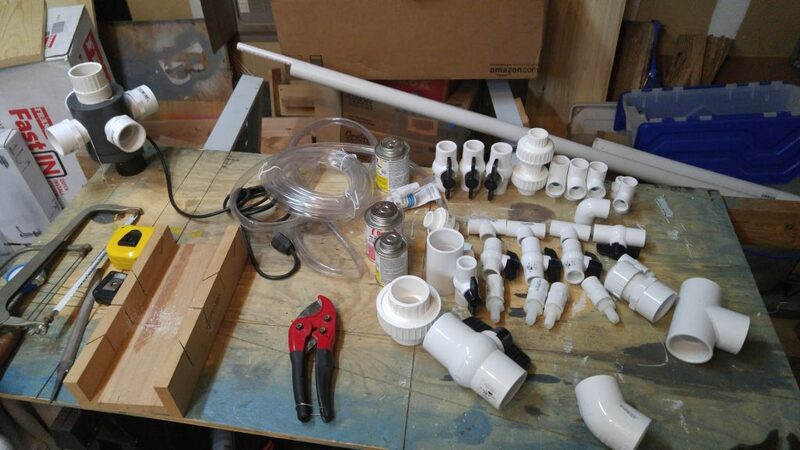 I have 4 more plumbing runs to dry fit and then I’ll be ready to start gluing it all together. I never thought it would take me 2 weeks to plumb one fish tank. The back of the tank is starting to look like spaghetti. Making everything fit and still clear all the unions and ball valves has been interesting to say the least. Here’s some updated photos for you to gander at. Well. No one lost their eye, but after sitting on my workbench for over 3 months my touchscreen on the PI has decided to stop working. Guess I’ll be ordering a replacement. Good thing these things are fairly cheap at ~$12. I decided I better hook up the electronics and test them before I get the plumbing finished. That way I can test out the electronics while doing the leak test too. 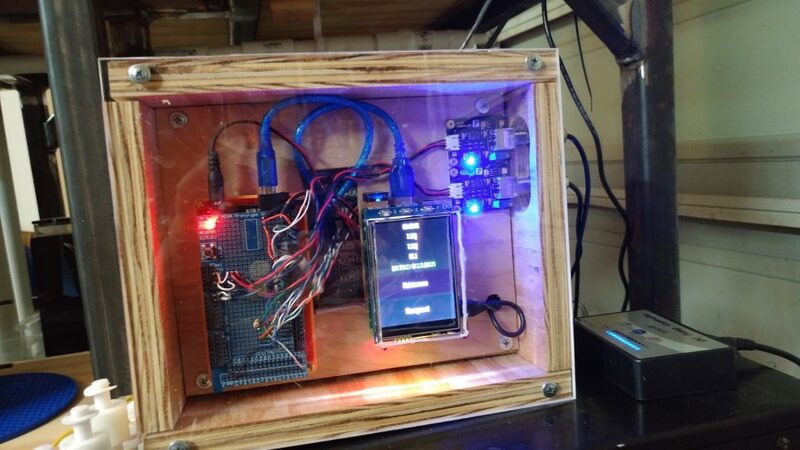 With the exception of the touch screen, the Arduino/PI stack is still working quite well. I finally got around to replacing the blown Arduino from when I accidentally shorted out the USB connector (blowing the serial interface). Everything else seems to be lighting up and working as expected. I got quite a bit of the plumbing done this weekend. I started on Saturday and quickly started running out of materials. Then I hit a snag. 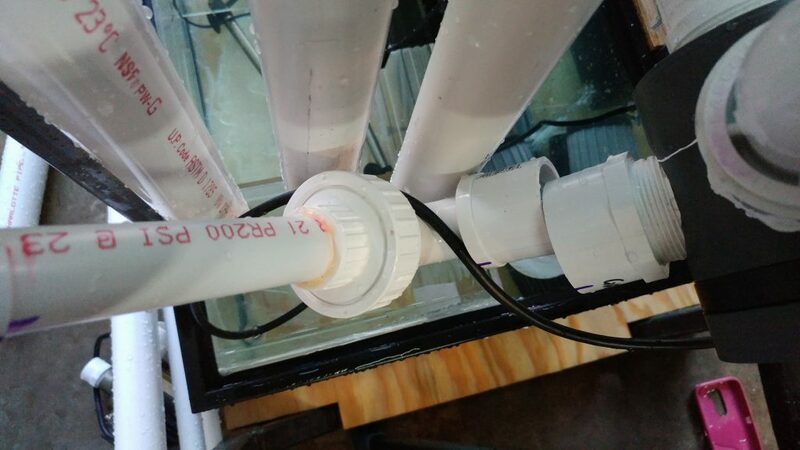 I found out the bulkhead I got for the closed loop was not quite big enough for 2″ PVC to go in to. 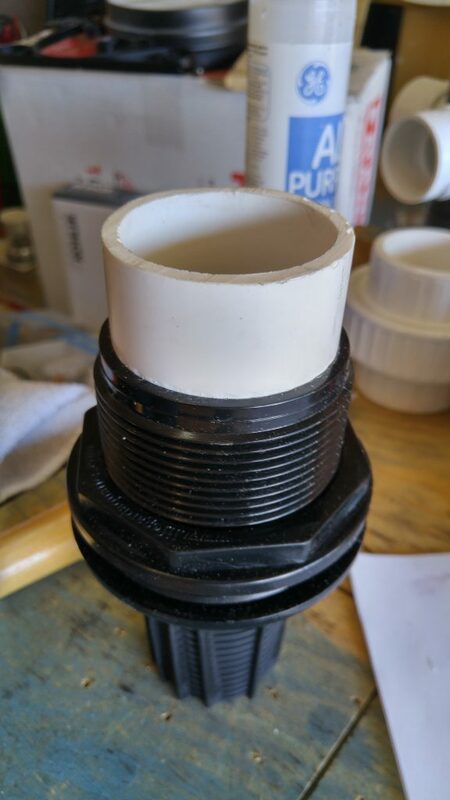 I ended up pulling out the lathe, making a plug for the 2″ PVC to go on, and then taking just enough off so that it would slide into the drain. Once all done, I put it back on the tank. Once I had that fixed, it was time to continue plumbing the rest of the pumps. By the end of the day Sunday, I had all of the drains for the over flow done and both inlets into the two pumps plumbed. Left to do is plumb the return from the main pump, the manifold for the equipment on the main pump, and the return through the Ocean’s Motions for the closed loop. 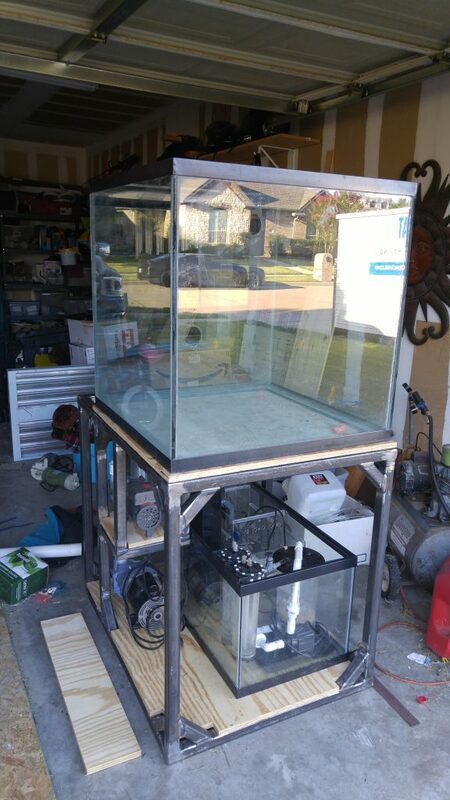 I was able to finish the stand over the weekend to a point where I’m ready to put the tank on it and start plumbing. None of the stand is painted, but that will all be done prior to moving it into the house. 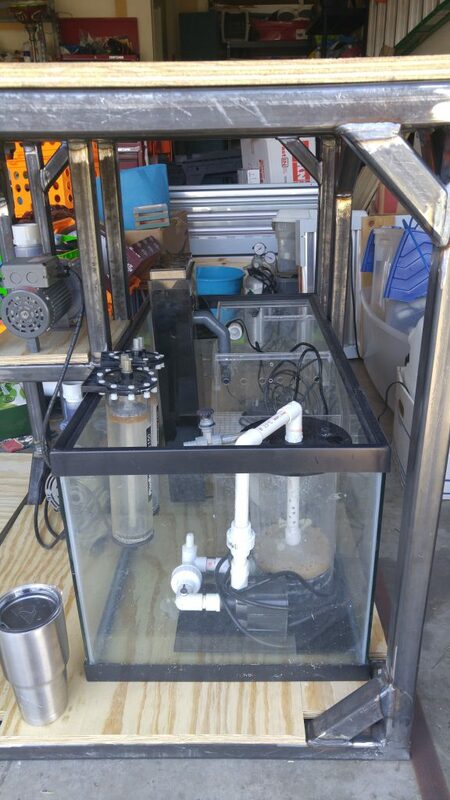 The plan is to setup the tank in the garage and leak test it prior to finishing everything else. As you can see in the photos, the extra time spent doing the CAD work was well worth it. There is NO extra space between the shelf and the sump. 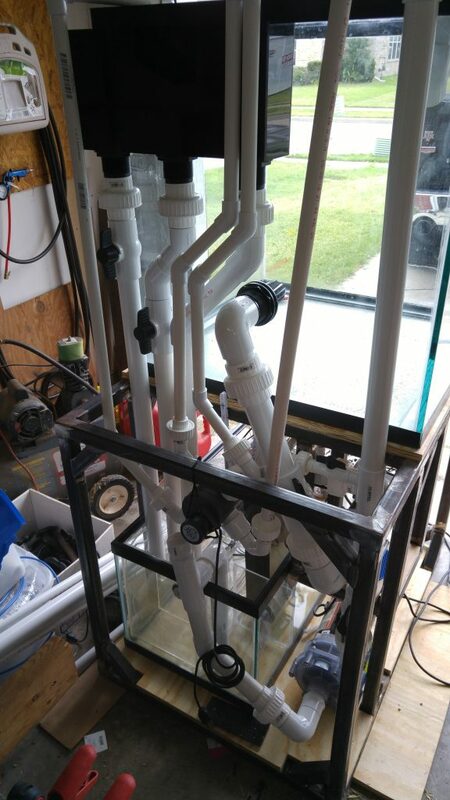 I still need to figure out placement for the CO2 tank and the top-off water tank, but that can be done after the plumbing is figured out. I had two friends come over and help lift the tank onto the stand. We probably could have done it with just two of us, but having a third person made things a little easier.